The gardens at Mottisfont Abbey are a year-round attraction. 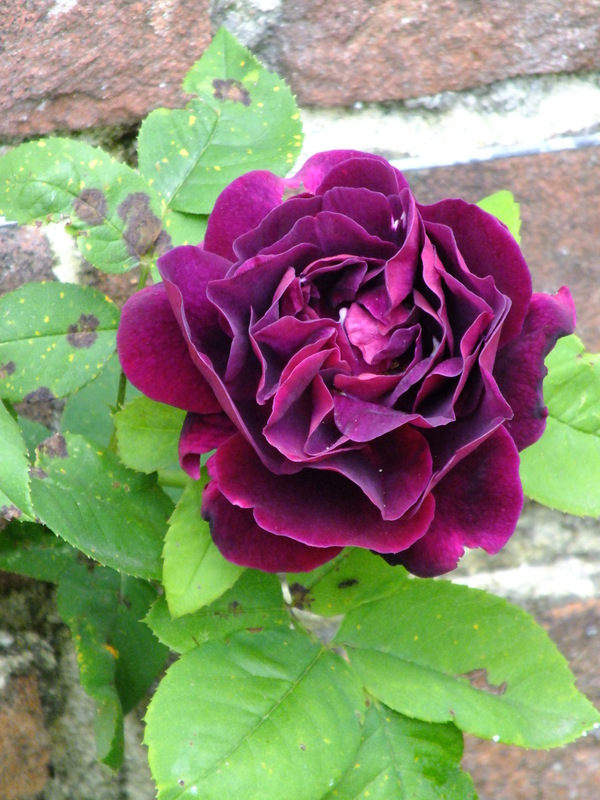 However, during June, when their unrivalled collection of Old-fashioned roses fills two (well, almost three) walled gardens with scent and dazzle the eyes with colour. It is an unforgettable experience. These roses have a historical importance beyond their beauty. They were collected by the late Graham Stuart Thomas, plantsman, writer, artist, photographer and rosarian par excellance. GST was Gardens Adviser to the National Trust from 1955 to 1974 and a major influence on many of Britain’s great gardens. Mottisfont is the most complete example of his work that survives intact. He not only established a comprehensive collection of pre-1900 shrub roses during the 1970s, but also displayed them in what was then an innovative fashion, With an artist’s eye and consummate knowledge, GST planned a garden that would combine roses with a mix of perennials to give a season-long display. A gateway set in a sunny rose-covered wall leads to the first Rose Garden with deep box-lined borders full of rambling and climbing roses and clematis on the high brick wall behind. The main paths crossing the site converge on a central round pool and fountain surrounded by eight clipped Irish yews. Long borders brim with plants chosen to compliment and underplant the roses. They also extend the season, providing colour, shape and scent before the roses bloom and after their petals fall. In June, the roses are accompanied by striking spires of white foxgloves. The northern section of the Walled Garden with its wide paths, is deliberately planted with a ‘cool’ colour palette to provide a counterpoint to the central Rose Garden. 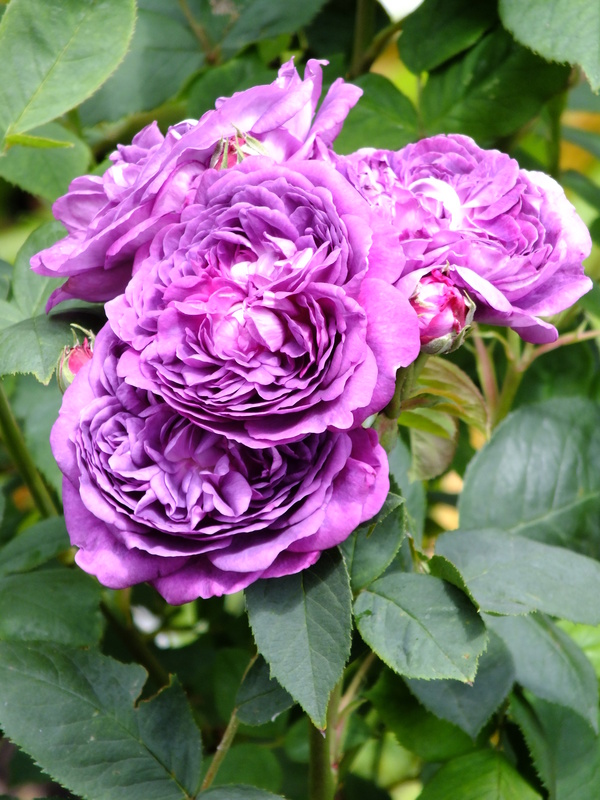 Born in 1860 and still going strong is the incomparable Reine des Violettes. 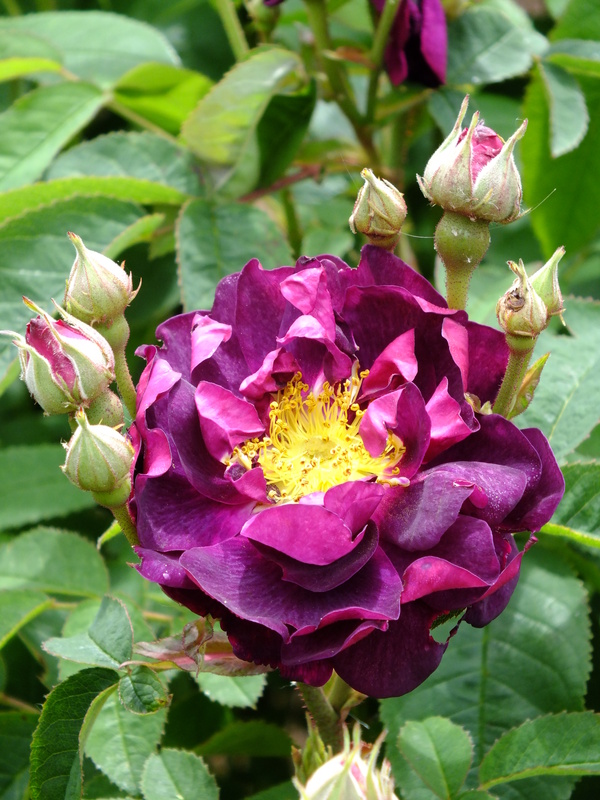 Although always classed as a Hybrid Perpetual this rose has more in common with the Bourbons, well furnished with smooth, somewhat greyish leaves, making a shapely rounded shrub and does not produce the abnormally long new growth associated with most Hybrid Perpetuals. I need say little about the flowers except that with age they expand to a flat array of soft parma-violet, showing the paler, pinker undersides of the petals around the fairly frequent button eye. Queen of the Violettes! Today it would have been called Queen of the Blues, most likely in an essay of flattery, but no blue could surpass its amazing richness. My experiences of this rose make me add that it must be well-nurtured and in good soil; it does not take kindly to poor soils. Assiduous dead-heading will encourage later blooms; those which appear later in the season surpass the earlier crops in deep colour. A good thinning in winter and a reduction of weak shoots is the required pruning. ← Mottisfont Abbey Rose Gardens – that’s the way to do it! This garden is on my bucket list of gardens to visit. What gardens have you visited and would recommend? Prince Charles’ garden at Highgrove in Gloucestershire has to be one of my most favourite and I have been but the once in high summer and no photography is allowed! It is absolutely one man’s vision, heir to the throne or otherwise, and the horticulture is first class, the breadth of the gardens exceptional. Small guided tours take around 2 hours. I’d love to go back in the Spring – and Autumn! Grateful to Redneck Rosarian for reposting this. Reine des Violettes is indescribably beautiful to my eye. I note you mention the efforts to fill the rose beds with complementary underplantings. Seems a valuable lesson for gardeners who often have rose gardens with nothing else in them. I think the addition of other plants only adds to the beauty of the roses. Lovely post.